This raised an old “image concern” continuously put-upon the band all throughout its history… Was Parousia a Progressive Rock band? A Punk band? A New Wave band? A Pop-band? An Alternative Rock band? The answer is YES, all of the above and that’s the way we liked it. This 2014 version of Miss Ogyny as it appears on the “Bloodstains” album is the identical recording from the 97-Rock “Home Grown” album, released on the StarStream record label in 1981. According to the reviews of the album, “the Bloodstains Across Buffalo LP is the first city-specific compilation in the classic BLOODSTAINS saga. It boasts ‘Fifteen essential punk rock blasts’ from Buffalo, NY, all from ‘the golden age of punk’”. There is an impressive list of artists appearing on the album featuring many of the top Punk/New-Wave bands from the 1977-1984 era such as the Jumpers, Aunt Helen [the (New) Toys], Lip Service, Electro-Man, the Enemies and the Vores. 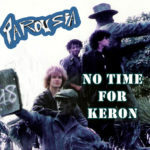 In the liner notes, it states that “Parousia was a Progressive Rock band looking to “cash-in” on the Punk movement”. Here is the excerpt from the album liner notes. For better or worse, Parousia played one-kind of music, the music we wanted to play! Sometimes our choice in cover-songs led us to the progressive realm (Yes, Jethro-Tull, Super Tramp, Max Webster, Toto, Journey, 10cc, Kansas) and sometimes it led us to heavy-rock, (Aerosmith, Deep Purple, The Tubes, Led Zeppelin, The WHO) to power pop, (Blondie, Cheap Trick, The Kinks, The Cars, Bowie, Heart, Pat Benetar). These cover-tunes influenced us and inspired us to write all sorts of our own music. In 1979, less than a year after the band was formed, that inspiration led us straight to the recording studio (aka: we finally had enough money). 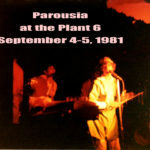 When Parousia hit Randy Filippone’s studio in June, 1980, we were bursting at the seams with ideas that included catchy melodies and unique rhythms. Once all of it was laid down, it led to some very catchy, interesting and diverse arrangements far beyond labels such as “Punk”, “New Wave”, “Progressive” or “Pop”. Track Four: “Miss Ogyny” (written by Kim Watts & Garth Huels). Originally recorded six months BEFORE we even knew that 97 Rock was going to have a band contest! The song was New Wave-ish in style but went way beyond that with the arrangement and production. Track Three: “Revelation” (written by Patt Connolly). A syncopated progressive rock song that lays heavy on the lead-guitar and growl-flute featuring two ripping instrumental solos. Track Two: “Malmedy” (written by Patt Connolly). A rock-operetta with an evolving story-line and several movements styled after some of the more complex (and heavily produced) music that influenced us at the time. Track One: “Oh My Love” (written by Garth Huels). A nod to 1960’s British Pop Invasion and Garth’s familial connection to Ray and Dave Davies of the Kinks. .
Six-months later, 97 Rock announced on the radio that they were looking for original material from local bands. The chosen-ones would be included on a vinyl record compilation to be released as A Home Grown album in February of 1981 titled “Buffalo Rocks Volume One”. Parousia mailed in all four songs from the recording session and when we heard back it was, “Miss Ogyny” that was chosen by Starstream Records to be on the first 97-Rock ‘home-grown’ album… Parousia had no say in it at all. It was obvious to us why they included ‘Miss Ogyny’. The song style was right on time to be reflective of current trends, such as ‘New-Wave’ music and the rise of groups like Talking Heads and the B-52’s. Parousia was chosen to appear on the album IF we paid the fee AND if we re-recorded Miss Ogyny onto a 24-track master tape. Once we answered yes and paid the fee, the band had only 48-hours to get our new 24-track Master to WGRQ… In a bit of a mad scramble; we booked ‘emergency time’ at Select Sound Studios on Elmwood Avenue in Kenmore. We booked a late-night session at Select Sound to re-record the song onto 24-track with exactly the same arrangement. We finished mix-down in the wee-hours of the morning and then delivered the master tape to WGRQ that same day. Anyway, the point being… The band didn’t record the song “Miss Ogyny” with the intent of capitalizing on a recent music trend … we did it because we loved to include different styles of music in our writing of songs. Parousia’s intent is to create diverse and interesting music and then share it with an audience, in hopes that some might enjoy it as we do. B1 –New Toys (2) F.Y.Y.B.